Centrance Mini-M8, my mini review and general impressions. Initial out of the box impressions. Mini-M8 – ipod touch 5G – Flacplayer app – Venturecraft 7N lightning cable – Dita The Truth IEMs and ATH-ESW11. Nice packaging, a step up from the early Hifi-M8 packaging (I don't know how the current packaging is). Inside is the standard set of the unit (Mini-M8), charger, two rubber bands, a USB-A to USB-B cable and a simple cloth bag for transporting the Mini-M8. No LODs or other connector cables included, the thinking behind that choice I am guessing is that many people who buy such devices such as the Mini-M8 usually have their own cables etc. Initial sound quality impressions are good, clear, more smooth than the Hifi-M8. Certainly I notice that there is less power than the Hifi-M8, the sound seems less `big` and more laidback. I understand that the output impedance is 1ohm on the Mini-M8, so I set the Hifi-M8 switch to 1ohm for general comparisons. Gain (I am not sure how to compare/match the Mini-M8 with the Hifi-M8 and wonder what gain settings would be best). Step one- is adequate but not loud enough for me. No hiss at full volume. Step two – Good sound. Lacks the beefy ness of the Hifi-M8 still (The Mini-M8 having a less powerful amp). At the extreme end of the volume pot, well PAST listenable levels there is a SLIGHT hiss. Step three – Good , I like it set at three. I have been conditioned in the past, perhaps erroneously that using the lower gain of a device is best (I prefer gain two on the Hifi-M8 for my ATH-ESW11). Also at the extreme end of the volume pot well PAST listenable levels there is a SLIGHT hiss. Note: At my regular listening level (Quite, quite loud) there is no hiss. Only when one turns it up well past acceptable levels. Each person has their own threshold for volume of course and I checked this out quite thoroughly. The smoothness can maybe be put down to a refinement in research, experience and design since the earlier Hifi-M8 was released by Centrance. The Mini-M8 certainly has a blacker background than the Hifi-M8 (unless you turn the volume pot to unlistenable levels, and I like a lot of volume, I usually use my device on my daily train commute). This is a short initial out of the box set of impressions. They are surface and quite superficial. I look forward to sharing my further insights after a few days of commuting, then at a week, a month and so on as the device and my ears burn in somewhat. 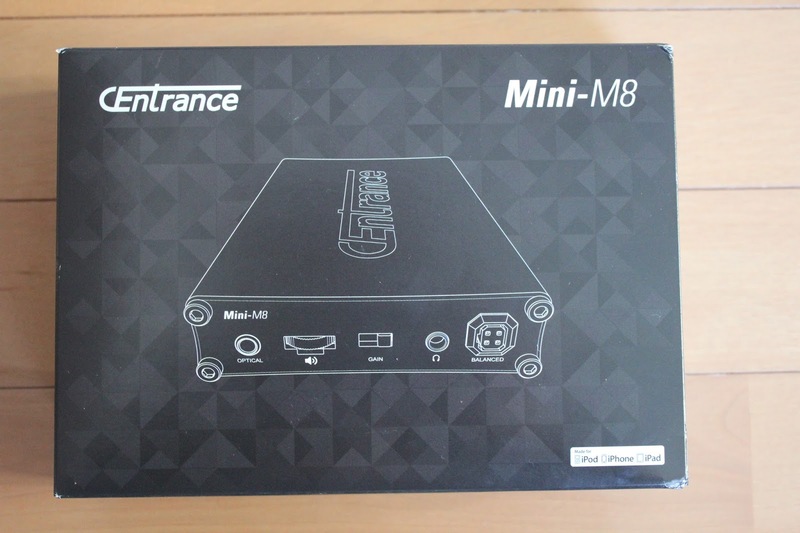 -Mini-M8, I am finding the vocals are quite forward compared to the music so far, whereas the Hifi-m8 seems more flat overall musically and vocally. -Gain 1 comfortable at full volume. -No hiss at full volume on gain 1 (? ), I think. -Ran to the train with it in my jacket pocket for 20 meters or so, no issues. -Gain 2 sounds better to me, more bass. -Hifi-M8 sounds like and ocean washing over me, Mini-M8 sounds thinner (excuse my flowery expression). -Hifi-M8 wows me still, I havent experienced that moment with the Mini-M8, yet. Dita - Hiss at extreme end of volume pot (I dont think anyone would be listening at that volume). ATH-CK10 - I experience hiss sooner on the volume pot that I do with the Ditas. 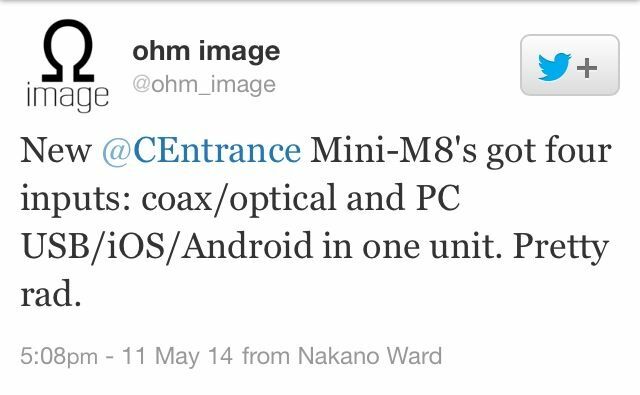 -Mini-M8 seems to be more even now. Whether I am adjusting to it, or the device is breaking in, I don`t know. -I`ve just started to enjoy now (Its around the four hour mark). *I like the type/text on the unit for the various functions. More clear than the Hifi-M8 icons. *A kobiconn Hifi-M8 with coax/optical in would be good for Hifi-M8-Mk2. *Although I do like how it sits in my hand and it feels robust. *The cloth case is a nice additional, just not velvet. -Enjoying low gain at full. When I go to Gain 2 it seems to get overloaded, lots of bass, vocal forward and occasionally screechy. -I need 4 turns on Gain 1 (max). -2.5 - 3 turns on Gain 2. -2 - 2.3 turns on Gain 3. Dita. Starting to get more head nodding to the music now. -More bass present, more background underlying melody audible after 4-5 hours. More musical, more enjoyment. -Seems more spatial/ getting more spacious sound. I let the Mini-M8 just play music through Apple earbuds to get a few more hours on it. Total playing time. Around 10 hours on the unit. (I recommend new users wait 5-10 hours of use before making any final initial impressions). Bass is now more present, highs have tamed down somewhat. Sub bass is still flabby, distorted at times. (This changed with more hours on the unit). The layers of music and separation is more clear and present now. I did have a wow moment when I first turned it on. The size of the case is perfect, just the material is wrong. The sound is authentic to the recording. Mini-M8 is unforgiving to bad recordings. Starting to get more into Hifi-M8 territory sound wise. (When I tried the demo unit at the Tokyo show it probably had a few hours on it). Gain 1- 3.5 turns on the volume pot. Gain 2- 2.5 turns on the volume pot. Gain 3- 1.5 turns on the volume pot. Shrill element could be the 1 ohm output impedance (I prefer the 2ohm switch on the Hifi-M8, takes off some of the extension of the highs). It is a portable unit, not a transportable unit. The weight and size isnt a problem. Its a good size for a pocket. My work friends impression, he has no Hifi experience. 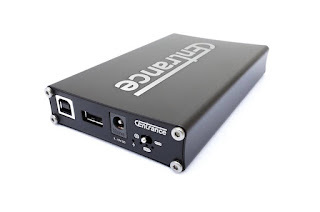 -Would be good to see a Centrance all in one Dap. -Balance was good. ipod sound is in one place, Mini-M8 vocals stand out, bass is better, music is separated, flows very well. I think with a few more hours it will be a great unit, most of the initial concerns about sound have passed now and cleared up over time. Hifi-M8 and Mini-M8 are both quiet players. I am trying to match the gain and volume to have an ideal side by side comparison. I think the Hifi-M8 is the better dac/amp. The power is very noticeable in overall smoothness, the Mini-M8 seems to be struggling at times. Hifi-M8 on Gain 2 , and Mini-M8 on Gain 3 seems to be the best match I can get for my ATH-ESW11 (Bass, and general spaciousness). Hifi-m8 is more silky smooth. The music and vocals seem to be placed fairly even. Mini-M8 the vocals seem to be more forward than the music, not terribly so. I could be that the Hifi-M8 low end is stronger. Yesterday (Day 4) I just let myself listen to and enjoy the player. The size is great. Sound is great. It fits well in my pocket. Hifi-M8 -Gain 2. Lovely, smooth, full effortless. Mini-M8 -Gain 2. I have to turn the volume up to get a full sound. 2 swipes. I have a slight pressure in my ears. 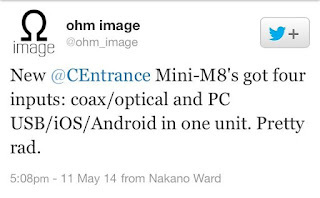 Of course Mini-M8 is designed with IEMs in mind. But the reports of it driving full sized headphones well leaves me wondering with my results with the ATH-ESW11. I also have ATH-A900 that I will try. I have yet to go to a headphone shop for further test for IEM hissing and large headphones driving power. Whats the weight difference? It seems very close. Hifi-m8 -gain 1. nice . lovely low end, although a bit thinner and less full than gain 2.) empty. doesnt struggle. less full low end. Mini-M8. Gain 1. plain. good separation of course. Could be more energetic. Overall. They are very close. very close. The Hifi-M8 is my benchmark. Of course it has a stronger amp. But the dynamics and soundstage and evenness of the music overall edges it over the Mini-M8 easily. Hifi-m8 of course is more a home and transportable device for use primarily with full sized headphones. The Mini-M8 being the smaller portable device for use primarily with IEMs and up. 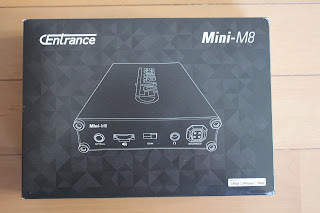 I would like the Mini-M8 to have more power. But does it sound great? yes, yes it does. Does it match the soundstage, separation and dynamics of the Hifi-m8? No, it doesnt. Not at the this point anyway. Will it open up after more time? The differences in sound between 1 hour to 5 hours made a difference. Either it was my ears or the caps etc burning in as some say. I dont know. I tried it with ATH-AD2000X and ATH-W1000Z. It sounded great. Full and extended. No problems with achieving an excellent sound. I tried it with various portables Amperior, Momentums,Urbanite, ATH-M40X, ATH-ESW9 and it sounded great also. The Mini-M8 does sound better with a more high end headphone. I cold spot the deficencies in the more cheaper headphones I tried the Mini-M8 with. I did not bother listing the cheaper headphones. I also tried it with various IEMs and found it to work well across the board 98% of the time. I sampled it with various Shure in ears as they seem to be problematic from reports. SE-535-v-j and SE535L-TDj worked well with no hiss, when plugged into the display in store full sized amp they gave hiss. Two turns on volume pot, a little hiss. Four turns -too much hiss. 2.5 turns is a good listening level volume wise. 2 turns on volume pot-slight hiss. 4 turns, too much hiss. 1.5 turns is an adequate listening level. One turn - no hiss. two turns. next to none. Three turns - too much hiss. 1.3 turns is a good listening level. So yes, there is a hiss problem with the Shure846 and the Mini-M8 but for me it is at volume levels far past my normal listening levels. I like my volume loud enough to give the recordings a bit of beef. The Mini-M8 is a great portable device, size wise with excellent sound. I recommend getting a few hours on it (5-10 hours). The Mini-M8 is of course the smaller sibling to the much larger Hifi-M8 and lacks the Hifi-M8s powerful amp, but its driving power is more than adequate. I find myself using Gain 2 usually. The Mini-M8 drives IEMs well, but as usual for most devices it differs in results with various multi driver IEMs. There have been reports of hiss (mainly with Shure 846), but overall I have tried with 10-15 multidriver IEMs and found the hiss to be minimal overall and at the far end unlistenable part of the volume pot. I have tried it with various fullsized headphones and have found that its driving power to be more than adequate. Of course the Hifi-M8 is more designed with full sized headphones in mind. My headphone-IEM selection at home has a darker mid focused sound, I was pleasantly surprised to try the Mini-M8 with a various range of headphones and IEMs and found that it was great match for lighter sounding designed headphones/iems with more extension and clarity. The sound of the Mini-M8 definitely echoes that of its larger sibling the Hifi-M8. Clear, dynamic, large soundscape, clarity and overall great performance. I havent yet tested the battery life of the Mini-M8 to draining point, but so far my charging has been minimal overall. 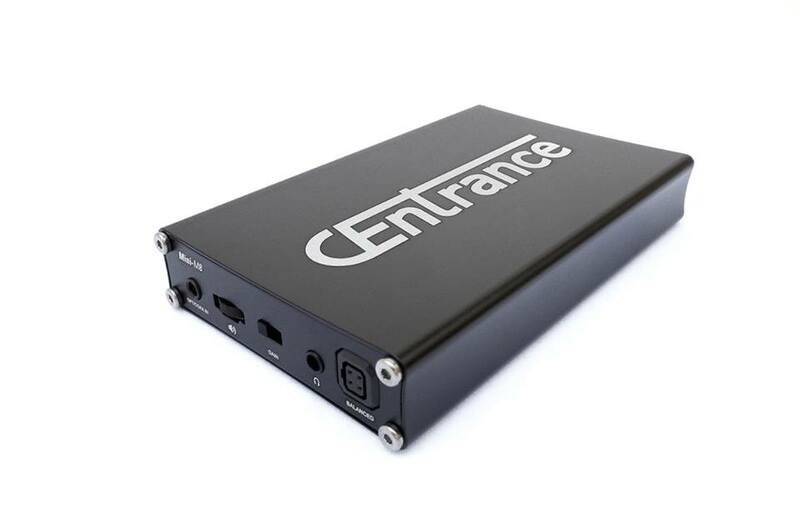 The ability to connect the Mini-M8 to various sources is an attractive selling point also, this versatility is what sets it above many other dac/amps on the market at the moment. The Mini-M8 has less bells, whistles and switches as the Hifi-M8 but I myself have no need for bass or treble switches, and the Mini-M8 output impedance set at a reported 1ohm makes the impedance switch largely unneeded. 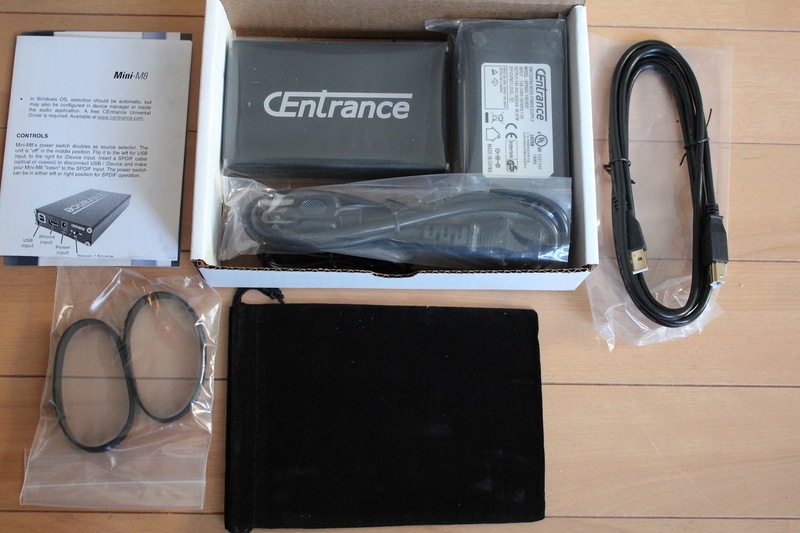 Overall, I give it an excellent rating for packaging, build, sound, versatility and performance. Thank to Centrance for sending me a unit to sample, experiment and report on.